Joojeh kabab is a classic chicken kebob recipe from Iran. 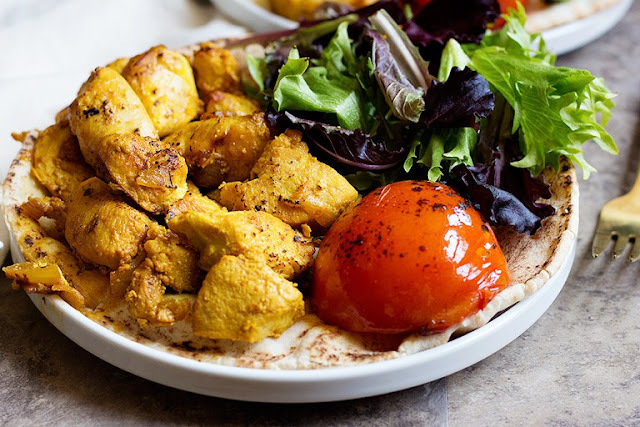 Chicken pieces are smothered in a delicious saffron chicken kebob marinade and have such delicious flavor thanks to saffron and lemon. 1. In a large bowl mix yogurt, sliced onion, oil, lemon juice and saffron and salt. 2. Place the chicken in the marinade and stir well so all pieces are covered with marinade. 3. Cover the bowl and refrigerate and let the chicken marinate for at least three hours up to twenty for hours. 4. Once ready to cook, place the bowl in room temperature for 15 minutes. 1. Thread the chicken pieces into skewers and grill on both sides until they are golden brown on the outside and white and juicy on the inside. 1. Heat 2 tablespoons olive oil in a large pan over medium high heat. 2. Put some of the marinated chicken in the pan and let them cook on one side before turning them to cook on the other side, about 3-4 minutes on each side. Do not over crowd the pan. 3. Repeat with the remaining marinated chicken. 2. Thread the marinated chicken into skewers and place them on a baking sheet lined with aluminum foil. 3. Cook the chicken in the oven for about 20 to 25 minutes until the chicken pieces are fully cooked. 4. Turn the broiler on and broil the chicken kebabs until they're golden brown, about 3-4 minutes, turn half way so both sides are golden brown. 1. I used chicken breast but this chicken kebab is delicious if it's made with chicken thighs as well. 2. Classic joojeh kabab is not spicy, but if you like your chicken kebab to be spicy, add 1/2 tsp cayenne pepper to the marinade.